High-performance computing (HPC) systems are a complex combination of hardware components. And hardware vendors are constantly working to increase speed, reduce latency, add cores, and make vectors longer to improve the performance of compute-intensive applications. But simply running an application on a system with better components doesn’t guarantee those components will be used efficiently. Getting the expected performance boost may still take code modifications. Fortunately, Intel® Parallel Studio XE has tools that cover all aspects of code tuning on Intel® hardware. 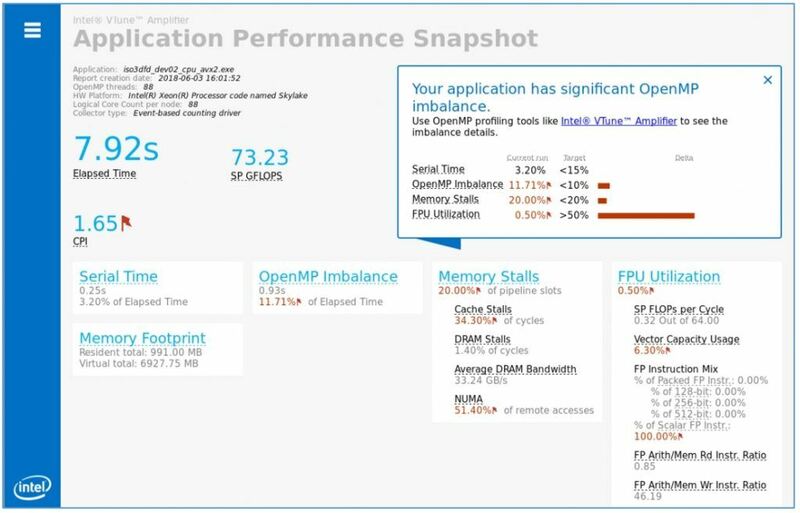 Sometimes it’s hard to know which tool to start with, so the Intel® VTune™ Amplifier Application Performance Snapshot (APS) is a good way to get a quick summary of your application’s performance characteristics―particularly the bottlenecks limiting performance. 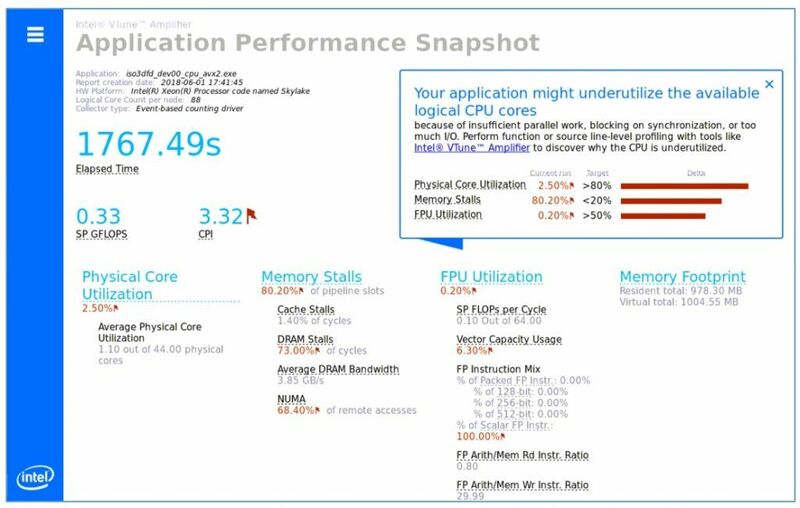 You can use the snapshot to select the right Intel Parallel Studio XE tool to tune cluster-, node-, and/or core-level performance (Figure 1). where ∇2 is the Laplace operator, p is the pressure field, and c is the velocity field. Finite differences can be used to express pt+1 as a function of pt and pt-1. Implementing a finite difference propagation kernel can be done with a stencil pattern. In three dimensions, a stencil looks like a 3D cross that we move across the pressure field. In other words, to update pt+1[x,y,z], we need to access all the neighbors of pt[x,y,z] in 3D. Figure 2 demonstrates the stencil pattern in 2D. In a real-world application, physicists usually implement a specific propagation methodology for corner cases. These corner cases are called boundary conditions. To keep the code simple in this example, we don’t propagate the wave on the borders. The straightforward implementation in Figure 3 computes a single iteration of the stencil. Figure 4 shows the APS report that appears in a Web browser. Of course, the initial single-threaded version of the application only uses one of the 44 physical cores on the system. This was recognized by APS as the major performance opportunity, so let’s parallelize the code. There are no dependencies in the loops, so let’s do a straightforward parallelization using the OpenMP* “parallel for” pragma on the outermost loop because it has the most work per iteration (Figure 5). Doing a quick check with APS shows that elapsed time has significantly improved (Figure 6). 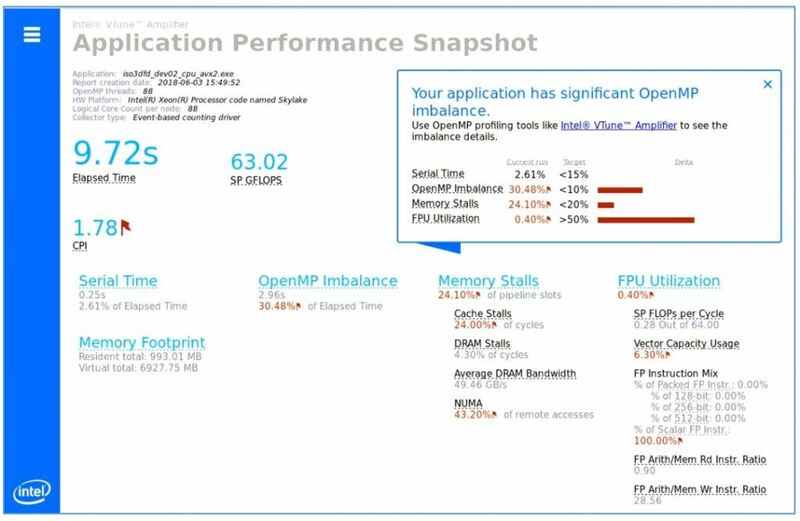 The snapshot reports some load imbalance in the OpenMP, but a speedup of approximately 38x is a good start. 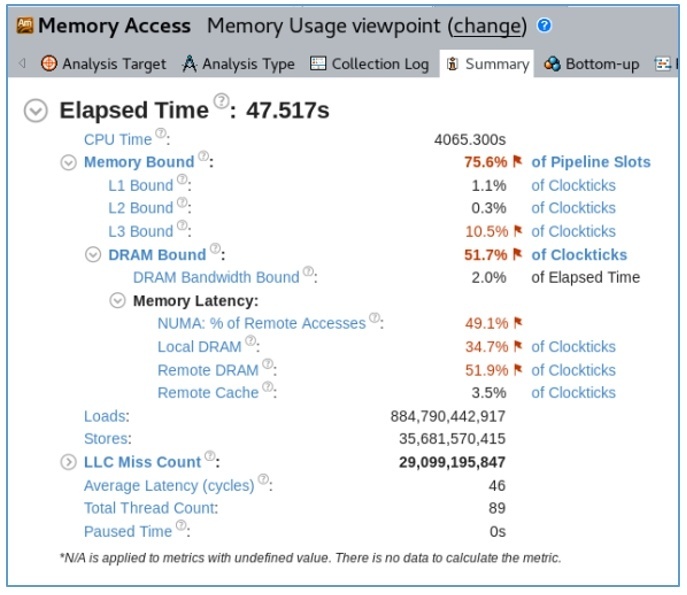 The more pressing performance issue is that the application is memory-bound. We need to improve memory access to remove this bottleneck. The analysis results are shown in Figure 7. The application is DRAM-bound, but memory bandwidth consumption is far from its limit (i.e., the DRAM Bandwidth Bound value is small). This is typical for applications that access memory with long stride. 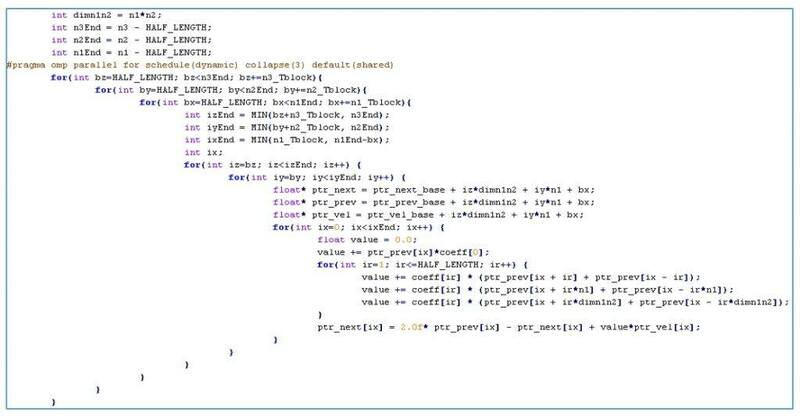 The Intel® Advisor Check Memory Access Patterns analysis can help us to detect which lines of code are causing the problem (Figure 8). A stride of 204,800 is exactly the size of our first two dimensions (512 x 400). This means that iteration by array elements in the innermost loop is not using the processor cache efficiently. We can fix this by changing the loop order (Figure 9). With this change, access to array elements in the innermost loop will be contiguous in memory, which should increase cache reuse. 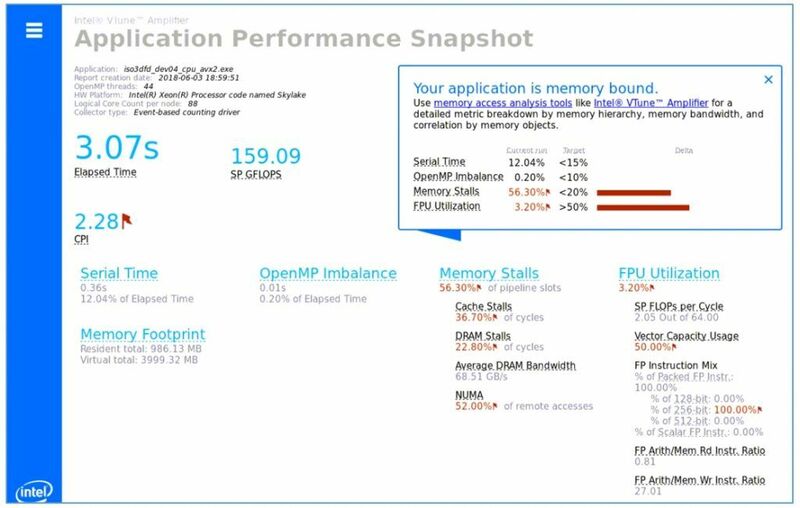 Let’s recompile and get another performance snapshot with APS (Figure 10). According to the report, we got a speedup of approximately 4.7x by optimizing memory access. The percentage of memory stalls is significantly lower and the application is no longer DRAM-bound. 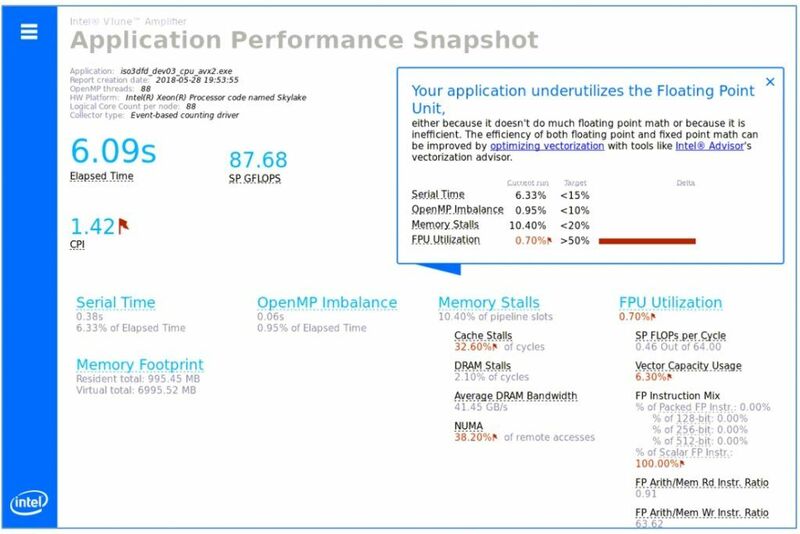 However, the OpenMP Imbalance reported previously in Figure 6, and again in Figure 10, is now the main performance problem. 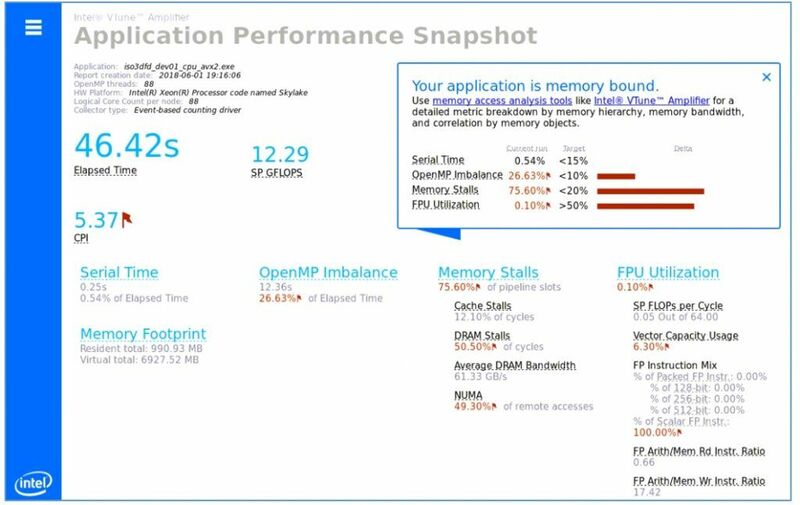 Even though we still have memory stalls, APS draws our attention to the OpenMP Imbalance, which accounts for 30% of elapsed time. OpenMP does static scheduling by default. This is generally an effective, low-overhead scheduling protocol. However, it can sometimes cause load imbalance, so let’s try dynamic scheduling (Figure 11) instead. This significantly relieves the load imbalance (Figure 12). Because cache stalls are still significant (Figure 12), we can try to optimize data reuse in the cache by implementing a well-known optimization called cache blocking (Figure 13). Please note that to feed OpenMP threads with parallel work, we added the collapse(3) clause to our omp parallel for pragma so that the three loops arranged for blocking will be collapsed into one large iteration space. The new APS shows a 1.3x improvement with fewer memory stalls and better OpenMP load balance as a result of cache blocking (Figure 14). 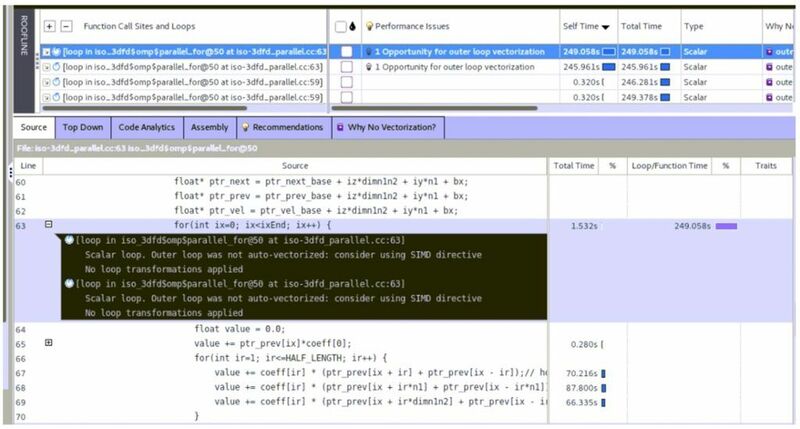 Opening the report in the GUI and looking at the Survey and Roofline tab, we can see that the tool advises us to apply a SIMD directive to help the compiler vectorize the highlighted loop (Figure 15). The OpenMP standard recently added the omp simd pragma to help compilers do automatic vectorization when they can’t determine if loop iterations are independent. So let’s insert the pragma and see if it helps (Figure 16). Recompile the application with the –xHost compiler option to use the proper vector instruction set. The APS report now shows a 2x performance improvement (Figure 17). Also, we can see that the vector capacity usage is at 50%. As we improved vectorization efficiency, however, we see that there’s now high pressure on the memory. We need to bring in much more data than before to feed the vector units, which is why we see memory stalls again. We could try further optimizations (e.g., using the -qopt-zmm-usage=high compiler option), but we’ve gone from a baseline performance of 1,767 seconds down to 3 seconds with just a few basic code modifications and effective use of Intel Parallel Studio XE, particularly APS. APS was helpful to quickly check optimization progress and identify tuning opportunities. 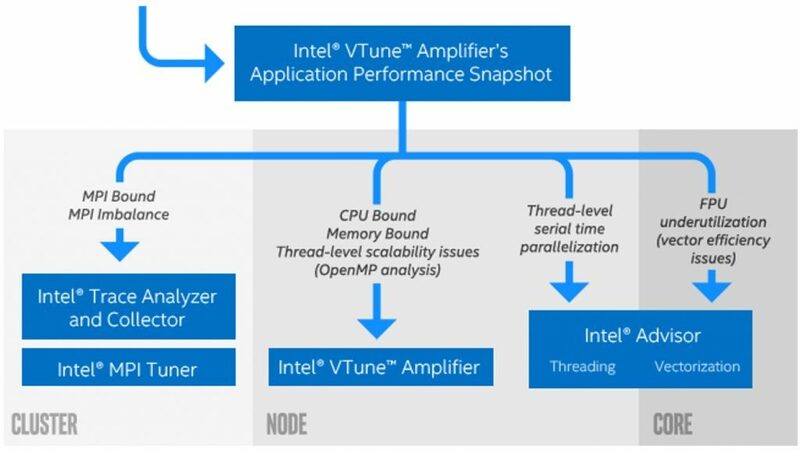 Intel VTune Amplifier’s Memory Access analysis and Intel Advisor’s Survey and Memory Access Patterns helped with deeper analysis of particular performance aspects.